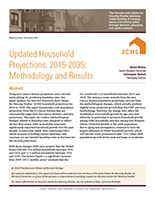 Using new Census Bureau projections and a revised methodology for predicting headship rates, this working paper updates the Harvard University Joint Center for Housing Studies' (JCHS) household projections for 2015 to 2035. The paper incorporates new population projections from the US Census Bureau that are substantially larger than the Census Bureau's previous projections. The paper also makes methodological changes related to headship rates designed to reflect the fact that recent shifts in headship rates have significantly impacted household growth over the past decade. In particular, rather than continuing JCHS's recent practice of holding current headship rates constant, we use trended headship rates as the basis for the revised projections. With these changes, JCHS now projects that the United States will add 13.6 million households between 2015 and 2025 and 11.5 million households between 2025 and 2035. The former figure is a significant increase from JCHS' 2013 "middle-series" estimate that the U.S. would add 12.4 households between 2015 and 2025. The increase stems entirely from the new Census Bureau population projections and not from the methodological changes, which actually produce slightly lower projected growth than the JCHS' previous methodology. However, the change does affect the distribution of household growth by age, race and ethnicity. In particular, it increases household growth among older households and also among non-Hispanic whites. Projected growth in the adult population, due to aging and immigration, continue to have the largest influence on future household growth, which will become more pronounced after 2025 when adult population growth levels peak and begin to moderate.